Thanks for getting me started. What a pain that was! I love you!!!!!!!!! I was 10 seconds away from taking a hammer to my WD MyBook, but then I came across this tutorial. So glad this ordeal is over. SERENITY NOW!!!!!!! Thanks for the article… was VERY helpful! Hi, I have a WD external 1T Book Elite. Couple of days ago, I needed a file from it, after using it, I didnt remove it from my pc, I just turned off my pc normally and went for a nap. After napping I turned my pc on and found out I couldnt access my WD any more. From “my computer”, I can see that my pc can see the WD, but can’t read it normally. As I clicked to the WD, it asked me to “format” the disk. I didn’t format it because I know it would destroy all of my 500Gb data. Also from “my computer”, I can see that my pc can see the WD, but when I click to “properties” it says, “free space, 0 byte; occupied space, 0 byte”. So to me, it simply means my pc cant read the WD any longer. I brought my WD to a kinda repair shop, desperately asked them if they can save my data? My WD has no physical damage, neither ‘formatting damage’. They said they can save 100% of my data, but the price is INSANE!!!!! Furthermore I have private data in my WD, I dont want them to be read by shops. I have a question for you, and you might know what I wanna hear, but please just tell me the true. My data mean everything to me. I’d pay that insane price to save my data, but hoping that my brother can help. My question is: by any chance, the failure is caused just because “the circuit board inside the enclosure” as u said above? If so, just simply remove the case and take out the data normally by using other cables? Please let me know. I’d ask my brother to remove the case, and have my data saved. He is an IT guy, but he lives hundreds miles away from me. Akimi, I don’t think what you’ve described is a circuit board error. I think you need to recover the partition using TestDisk (or similar) as mentioned in the post. No offense, but you don’t sound like the most technical user, and perhaps it would be safer to send the drive to your brother to run the recovery software. Thank you, Carton. I’ll bring it to him. Must find time though, can’t go to him right now. No, I’m not a technical user. I don’t dare to remove the case myself anyway. Also the shop told me, it would take them daysss to recovery the data. If what they said is true? Hi Calton, you were right. We used File Scavenger to get the data back. Thank you. Glad you were able to solve your problem and recover your data! Yes, my 2 TB WD Driveas hardly been used, the blue light comes on and you can hear it running but it has dissapeared from my pc it is only just a few days over 12 months old, but it has lots of personal things on it, what am i to do. Thank you so much for this article. It saved me from thinking the hard drive was fried with a resulting loss of data. I took the drive out (in this case a WD green 1TB), installed it in my computer as an internal SATA drive, and the drive was fine! All data intact. As you stated, the controller card was indeed the likely culprit. Too bad, I really like the “My Book” external drive enclosures. Sounds like the drive is encrypted. You need to install it in another Western Digital enclosure. Hi, your directions were extremely helpful, thanks. I have a WD My Book Home 1TB that went south but I believe the culprit is the port circuit board. I have dismantled the drive and I am waiting for the arrival of the Thermaltake docking station. However, where can I get a replacement port board? I am unable to find one online but I assume they must be available. WD is not being helpful but it is out of warranty. I don’t know of any source for just the circuit board. If your drive is not encrypted, your best bet would be to get a non-WD enclosure and use it. If it is encrypted, you’ll need to get an identical enclosure (retail, Ebay, etc.) and use it to read data from the drive. I’m not sure how to tell which circuit boards have the encryption chip and which ones do not, other than trying to read the drive and seeing if it is readable or not. Hmmm, not sure what the problem could be. The jumper isn’t typically needed. Usually a reformat is all that is needed. I’ve been told by a tech from a repair shop that WD cases just read WD hard drives. I was trying to install a Maxtor HD. In fact this happens I tried other brands with no success. So best advice is to stay away from WD cases. I have spent many hours with my problem and have scoured the internet for a solution and have come across your website. Hope you can help me. I have a WD Mybookworldone 1TB NAS (WD10000D033) drive. Similar to question above it kept dropping out from network and needed disconnecting and reconnecting to keep access. Last time I disconnected it it would not start up again. No blue circles, no fan and no startup whine. I have removed the (2) drives from the case and connected them to my PC (Win7) via USB at first then via SATA cable. Both drives started up (heard the whine). For each connection I get the drivers loading and the device manager recognises each drive but the OS does not know the drives are there. What I need to know is WHAT NEXT??? I have read that the original case driver card (PCB 2061-701482-003) encrypts the data for the drives. Is that correct? Do you know of any way that I can bypass the encryption and recover the data from the drives (it is very important so I cannot reformat the discs)? Any feedback would be good especially if it is positive. Ken, the WD NAS is different as it has it’s own Linux-based operating system that formats the drives. It does not use the FAT or NTFS file systems but instead a Linux-specific file system. I believe it uses the ReiserFS, but it could be ext3. It addition, the WD NAS could be configured to strip data across the drives using RAID. In short, you won’t be able to access the files on a Windows PC. Your best bet is to buy an identical Western Digital NAS and install the drives in that to recover the data. After recovering your data, if your looking at different NAS options, I can highly recommend the Synology NAS. I used the the built-in backup tool to replicate all critical files to Amazon Glacier. Made an exciting discovery today…. I purchased a new WD NAS drive to replace my old one (as above). The idea being that I would try to swap the two drives from the old casing to the new one. The new drive arrived the other day and I connected it up using the OLD power supply (12Vdc 4Amp)as it was alrady plugged in behind my desk. The new drive did not start. I then used the new power supply and all started OK. Managed to back up my PCs over the network. Thinking about the problem a bit more I tried running the old drive using the new power supply and lo and behold it started. It appears that he problem was with the power supply and NOT with the drive itself. Although the power supply gave out 12Volts it must be lacking in the power output and thus not being able to start up the fan, lights and drive motors. If you refer above I was getting a clicking sound from within so there must have been enough power to drive the 5Volt side of the output board to the drives. I wonder if your other correspondents had power supply probs rather than drive probs???? 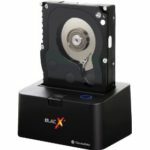 If I use the Thermaltake BlacX eSATA USB Docking Station you describe, can I use this with a Windows machine to pull the data off? I.e. can I just plug this docking station into my Win7 machine and it will read it just like an external USB drive? Or do I need a Linux-based system to read the data off the drive (given that the MyBook NAS is Linux-based)? A MyBook NAS has it’s own OS and uses a Linux format for the drives. You will not be able to read the drive under Windows. There may be a driver available to read ReiserFS or ext3 (or whatever format is uses), but you’d better be sure you select the right one. The ThermalTak dock will physically work; reading the file system under windows is the issue. Hola Carlton, thanks for all the instructions. I have a little problem though. WD 2TB, after turning on BlacX shows in the screen ‘The disk you inserted was not readable by this computer’. Help!!! I Tried to reset but can’t find the pins 🙁 I can send you a pic of the screen and HD. Thank you!!!!!!! Paula, there aren’t any pins on the drive to reset. It should work when inserted into the BlacX Dock. . . unless the original Western Digital Enclosure encrypted the drive. So either the drive itself has gone bad or it is encrypted. You definitely should not initialize the disk as that will corrupt the data if it is encrypted. I suggest you try the software listed (TestDisk and/or Runtime.org Get Data Back) to see if any data can be recovered from the failed drive. If that software can’t find any issues, then that means the drive is encrypted, and only an identical Western Digital enclosure can be used to decrypt and access the data. The USB port broke off the circuit board from my WD 500gb external hard drive. I am no longer able to connect to my computer, so I bought a spare hard drive case from a local computer shop. I followed the instructions of the store clerk and put the old HD into the spare case. When I connect it to the computer, the computer recognizes an usb connection, but does not show the HD in my computer. The only thing it lets me do is “safely remove” the drive. In order to place the hard drive in to the new case, I had to remove a circuit board which connected in to the SATA Power slot, as well as provided the USB connection and the socket for the power socket for the original WD case. Would the removal of this circuit board be the cause of the hard drive not working when in the new case – on a related note, I reconnected the circuit board and manually held the usb port on to the circuit board it had broken off from and it connected to the PC and the WD password software popped up. So I know the hard drive itself functions fine. It sounds like the drive isn’t being read properly by the new enclosure. The circuit board isn’t the problemmdo you hear the drive spin up in the new enclosure? I have the exact same problem. Yes, you hear the drive spin up in the new enclosure. I have replaced my WD 1TB MyBook successfully with a new identical drive but cannot get my computer to recognise the new drive. You mentioned above that you must ‘short’ the onboard board in order to recognise the device? I downloaded the WD Quick format tool and this recognises the S/N of the new drive immediately but cannot format. Thanks million, thats exactly what I was looking for. Good karma for you! I have a 3 TB WD “My Book Essential”. It has worked fine in the past and has a bunch of data on it. However, when I plugged it into my laptop today it be recognized at all. The light is on, I hear the drive spin, and yet nothing happens on my machine. The laptop won’t even recognize something is plugged in. I take the same USB 3.0 cable and plug in my other drive using the same cable in that same USB port and that is read just fine. Terry, it sounds like something is wrong with the controller board in your enclosure. Your computer should at least show that something is plugged in. Because it is not, it’s most likely the enclosure controller board. I have removed the 3TB drive from the WD casing. A buddy loaned me a CoolMax Sata Converter cord and I unlike a few days ago, I hear my Win7 machine recognize the drive. Well, it must not full because it says it installed the drivers and is ready to use but when I go to “My Computer” it doesn’t appear. I know I have a good amount of data on there but when I go to the Disk Management screen, it shows, “Disk 3, Basic, Online, and 746.52 GB Unallocated”. What do I do next if I believe my data is still there but I can’t access or see it? This means the the original WD enclosure encrypted the drive. You need to install the drive in an identical enclosure and it should auto-decrypt and be accessible. Thank you so much for all of your help so thus far but I have another question / update / challenge. I’ve been doing a little research and found that SOME systems have a BIOS issue w/3TB drives. Could THAT be my problem at all? I *think* I did update my BIOS on both my laptop and desktop but that didn’t do it. So I should head off to a Best Buy and find this unit and throw my drive in there, that’s your suggestion right? If it worked with the other enclosure, it’s probably not a BIOS issue. A new enclosure is the safest bet. Let me know how it goes. I have a 3TB my book which is encrypted. Now i forget the password but i need the data. As per my understanding till now from this forum that password is stored on the circuit board and if i buy another 3 TB and use its circuit board to open the drive, it will work. Please suggest if i am wrong. I will chime in to update Carlton and for anyone else that cares. I bought a new WD 3TB case and it didn’t appear to do anything for me. Except that I learned my previous USB 3.0 cable was bad so when I used the new cable my drive at least ‘somewhat’ recognized when I plugged it into any given machine. In Data Management I could continue to ‘see’ either a 2TB partition (which said “Unallocated”) or a 764 gig partition (which also said “Unallocated”). Either way, I couldn’t do anything with this and my only option was to ‘initialize’ which I didn’t do. I downloaded EaseUS Partition master and I seriously thought I was in business. It ran through and showed all 2.7 TB available and I went to look at some of what I could do next and it looked like it was hanging and hanging and doing nothing so I then stopped the program. That might have been the death of my drive as that was the my drive worked at all. NOTHING. NOTHING AT ALL from here on out. Now when I plug in the hard drive you hear it start up but it won’t even be found in the “Disk Management” section of Windows 7. I’m pretty much convinced I have in fact lost my ONLY copy of 2.5 years of video recordings. Probably close to 1 TB worth. Lesson(s) learned – of course. Does that give me a warm and fuzzy feeling or make it better – of course not. Sorry to hear you were not able to recover your files. Based on your description, it sounds like the drive was mechanically failing. A professional data recovery service might be able to remove the platters and recover data from them, but that’s an expensive proposition. Yes, you are wrong about password encryption. It is stored on the drive, not the enclosure. Without the password, you will not be able to access the data. hi, if the circuit board is dead, can I just replace it with the one in my second WD1T to get the data of the harddrive? I want to recover the data on it and have done extensive research to see how and if it would be possible. The Power source has been plugged and unplugged so much over the last day or so (praying that maybe just once my computer would recognize so I could fetch the data) that I wouldn’t be surprised if I lost my data just by doing that. When I initially plug it in, you can hear the drive start up and spin for a few seconds and then it dies down. I have about 750GB of data or so that I want to fetch. Anyways back to my question, once I disassemble the drive from the case, would I have just as much luck (if any) connecting the bare drive with a USB to SATA adapter to the computer as I would just trying to install the drive internally? I know all of this is a long shot, but I have tried recovery software (no luck since the drive can’t be found) and with the research that I have done; I am almost wondering if it is just the little USB circuit board that is attached to the drive, giving me the problems. What do you think would be my best bet? Danny, your best bet would be to install the drive in a new/identical Western Digital enclosure. The second best option would be to use a different adapter/dock/enclosure (USB-to-SATA) or the internal SATA cable in a desktop computer. Good luck! I accidentally started putting a backup of my computer on the MyBook. Realizing what I did I stopped the process. Since the hardrive started reformatting I can’t see my MyBook any longer. If I remove the hard drive and use data recovery software will that work still or what would you suggest? correction. I can see the drive but not the files or documents. If the harddrive “started formatting,” there aren’t any files or documents, as they have been erased. However it is possible data recovery software may work. Hi I hope you can help I have a1 terabyte my book Mac, Western Digital. I took it out of the enclosure and connected it directly to my PCs SATA. The drive spins and everything but when My PC boots Bios says that there is a drive slave error. When I go into the BIOS the BIOS doesn’t even show the drive connected. I’m thinking that this is a PCB issue. There was a faint scar of heat on the bottom of the PCB. Can I just replace the PCB. If so, will the Western Digital Drive then boot up, if it was a circuit board issue? I have to recover the photos on that drive. There are family member photos of people who have passed away and the pictures are priceless. Donald, replacing parts and PBCs on the drive itself is not an easy or straightforward task. It can be done, but it’s difficult making sure you have identical parts and isolating the actual problem component. Data recovery services are more likely to be able to do something like this. I’ve got 4 WD My Book harddrives, and the same problem with each, which literally just happened all at once. I plug them in and they attempt to power on, but then stop, and the blue light on the front doesn’t come on. Is there any chance at all that the drives themselves are still good and just need to be transplanted to a new enclosure? Thank you for the valued postings and all the facts and good answers to the different problems with WD My Book Essentials 3.0 TB. May I please ask you one more question about the advice to install the drive in a new/identical Western Digital enclosure. Will the new enclosure with the new USB-To-HDD encryption board be able to read my “old” HDD content OR will the new USB-To-HDD board maybe having a different encryption algorithm and by only installing the old SAME SIZE HDD into the new enclosure change the already hard-ware-encryption because of the new USB-To-HDD board writing a new and different encryption or will the encryption having the same hard-ware-encryption-algorithm so it will be able to read the files in the old HDD? I do not dare to connect the old HDD into the new enclosure before I know that this action is safe? Do anyone on this excellent Forum have a positive experience by the suggested solution to install the drive in a new/identical Western Digital enclosure. I have now an identical new WD My Book Essentials 3.0 TB but there is a different Rev AG in the new compared to Rev AE in the “old” USB-To-HDD board fasten on the HDD and handling the USB 3.0/Power cable. I would of course very much appreciated any more light on this suggested solution before I will connect the old to the new enclosure! Wishing you all the very Best sir! Charl, the enclosures *probably* use the same encryption chip, but there is always some risk that it could change. If it were me, I’d only use the same revision of board/enclosure from the same drive size. You’re probably OK using something similar, but I’d do everything possible to minimize the chance of a problem. I had the same thing happen with mine. I pretty much figured that it had dropped a head or something. I openned the case and then openned the drive and there it was… one of the heads was broken off between two of the platters. I put a couple of harddrives on the circuit board of the mybook and both worked. I put an old WD 60G sata 3.5 and a 120G Toshiba 2.5 notebook drive. Both worked without any need to format. I have a 3-4 (maybe older) My Book so it may not have the propriatery junk on it that some folks have talked about. I am thinking of putting a 2T WD Green in it now. Don’t need any kind of high performance stuff. 1. MAC and PC cannot detect the drive. When power on the My Book power switch. 2. PC cannot read from the drive (Message said Un-formated drive) using other USB SATA mount. But it can be detected. MAC just does not show anything. 3. The recovery software (on PC) returned sector errors and reported that I got bulky files from hundreds Mb to Gb in the drive but I only have photos stored in it more or less 6-32 Mb per file. 4. The My Book enclosure cannot be detect or use attached with other functional hard disk. I Assumed the following happened. 1. The enclosure PCB no longer functioning and it might encrypted the drive already. 3. In the bulky files that recovery software found may be the encrypted files that I have. 1. Was the encrypted file able to return to normal files? 2. Sent it to the professional recovery and get those bulky files? Which I can get those myself at home. What is my next step to have the photos back. I’m in process now. Im hoping data rescue 3 on my Mac will pull the data from the removed WD my passbook essentials hd. Any other suggestions with retrieving data? Hi carlton one of my wd 2tb my book failed. If it’s in a RAID 1 configuration, the two disks should be identical and the working drive can be recovered. If it’s in a RAID 0 configuration, data is spanned across the two drives and probably can’t be recovered. Your article is a great guide! I face a problem (which unfortunately seems to be quite common with WD external drives) : I have a WD MyBook 4 TB usb 3.0 external drive. Since yesterday, it does not appear to explorer but it appears in disk management as “unallocated”, having the correct space (3.64 TB), and also it makes the normal reading noise and its light is constantly on (no blinking). I tried to use programs like testdisk or Minitool Partition Wizard to restore the damaged table/partition, but they could not do it. I have 3 tb of data in there, so my next try will be to open the case and use a USB-to-SATA converter (http://www.amazon.com/gp/product/B00CPGYNV4/ref=oh_aui_detailpage_o00_s00?ie=UTF8&psc=1) to mount the drive on my laptop via SATA-usb (I do not have a desktop computer). I also read that WD used to hardware encrypt its disks, so in case the sata-usb adapter does not work, I may suspect that the PCB of the drive may have failed. So, I may order and replace the old PCB with an identical new one and I hope my drive will work again! What do you think of my plan ? I don’t think replacing any of hardware you mentioned will help. I think you should try different data recovery software with the configuration you have. unfortunately no data recovery software had an effect. There is no possibility that my PCB is the problem? It’s definitely possible, but not high on the list of likely causes. Generally these failures are related to something mechanical. But it’s worth trying. Hi, I’ve been trying to use a Samsung 1Tb drive in a my book home enclosure, I know the drive is good but am not sure about the enclosure(bought off ebay) however my win 7 can see the my book in devices and I can hear the disk spinning but I cant see the drive as a hdd device to save to? In disk management the drive is not initialized and I am unable to initialize it. Is this a compatability issue or am I missing something? Hi, I’ve read through your post(which is great) and through the comments to try and find out if I can use a Samsung HDD in the enclosure? I have tried resetting the chipset memory and I can hear the drive spinning up but it just doesn’t show on my Mac or pc. I have an adapter that I can plug straight into the HDD and I know it works. Please help!! You probably have one of the enclosures with encryption that requires WD drives. Hi Carlton, in the WD My Book Essential 3Tb USB 3.0, can i replace the original hard disk (SATA 2 , I think ) to a new HDD of another brand (for ex. HGST 4Tb SATA 3)???? I’m not sure about that specific version, but I’m guessing probably not. The SATA3 interface isn’t the problem, but using a non-WD drive that’s not designed for that enclosure might be.